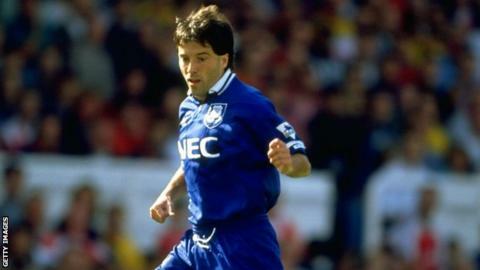 Former Everton winger Predrag 'Preki' Radosavljevic has announced he has accepted a coaching job "in the UK", but is yet to name the club. The 52-year-old has left his role as coach of Sacramento Republic in the third division of US football. The announcement saw British bookmakers install him as favourite for the Leicester City job. "The opportunity ahead is a chance to challenge myself at the highest level of the game," said Preki. Leicester are the only team in the Premier League and Football League currently without a manager. Nigel Pearson was sacked in June, despite guiding the Foxes to 14th in the Premier League in 2014-15. Serbian-born American Preki won 28 caps for the US football team after acquiring US citizenship in 1996. He spent two years at Goodison Park after being signed by Howard Kendall in the summer of 1992 and made 25 starts for the Toffees, scoring four goals. He then moved to Portsmouth for £100,000 but spent just one season at Fratton Park. Preki spent the majority of his career in America, playing for indoor side Tacoma Stars and Kansas City Wizards in Major League Soccer. He has managed Chivas and Toronto in the MLS and was named MLS Coach of the Year in 2007.